The 2,270-seat Rivoli Theatre, a Greek Revival building designed by Thomas W. Lamb, first opened to the public on December 28, 1917, with the Douglas Fairbanks movie, "A Modern Musketeer," supported by a "live" program featuring musical soloists, the organ and house orchestra. Loge seats were $1 at all times. General admission was 60 and 30 cents for evening performances, and 30 cents at matinees. The Rivoli was conceived as a sister theater for the Rialto and a place where, as at the Rialto and other Roxy theaters, music would be featured. Noted for its acoustics, the Rivoli auditorium was originally designed to showcase Dr. Hugo Riesenfeld's fifty-piece orchestra, plus a once-a-week performance by the combined orchestras of the Rialto and Rivoli, called the Rothapfel Symphony Orchestra, after theater impresario S. L. "Roxy" Rothapfel, who managed both it and the Rialto. After opening the Rialto in 1916, Roxy had quickly noted the importance of music in his programming, especially the popularity of soloists, the organ, and the orchestra. Though other movie palaces of the 1910s and 1920s had stages to present stage shows and elaborate dramatic acts, the Rivoli originally had no stage. It had three proscenia – a center one for a screen and side ones for soloists and an orchestra. A full stage was not built until 1926, when it was used to accommodate the sorts of stage show presentations that had become popular in the 1920s. In its middle years, the Rivoli was one of New York City's finest 'roadshow' theaters and was converted to 70mm Todd-AO with a deeply curved screen by Michael Todd in the 50s for his feature, "Around the World in 80 Days." Many other 70mm films played there including "West Side Story." In 1963, Fox put up an Egyptian façade on the building for "Cleopatra" which was kept until the 80s when it was altered to avoid the building being landmarked. Sadly, the theatre was demolished in 1987. Wurlitzer's Op. 839 has a factory date of June 2, 1924. The original organ in the Rivoli Theatre was built in 1917 by the Austin Organ Company for the "Triumph Theatre," the planned name for what ultimately opened as the Rivoli. When the Wurlitzer organ was installed in 1924, the Austin organ was moved to the John Lingrend residence in Minneapolis, Minn. In 1928, the organ was moved by Harry Oliver Iverson, organ builder of Minneapolis, to Central Lutheran Church in Minneapolis. The following specification is from the Dedicatory Recital program (March 4, 1928) of the organ in Central Lutheran Church, Minneapolis. It is not known if the organ was altered since its installation in the Rivoli Theatre. AJWB Collection. Specification of Wurlitzer Organ, Op. 839 (1924). Belton, John. "The Rivoli," "in 70mm," (Issue 59, Dec. 1999). Dedicatory Recital	program	with	specification	(Mar. 4,	1928)	of Austin	organ,	Op. 709. Courtesy	Jeff	Scofield. Melnick, Ross, and Andreas Fuchs. Cinema Treasures: A New Look at Classic Movie Theaters. St. Paul, MN: MBI Publishing Company, 2004. Cinema Treasures web site. Interiors. Central Lutheran Church, Minneapolis, Minnesota. Console of Austin organ, Op. 709. Courtesy	Mark Kieffer. Joe Coco Collection of New York Theatres. Exterior. 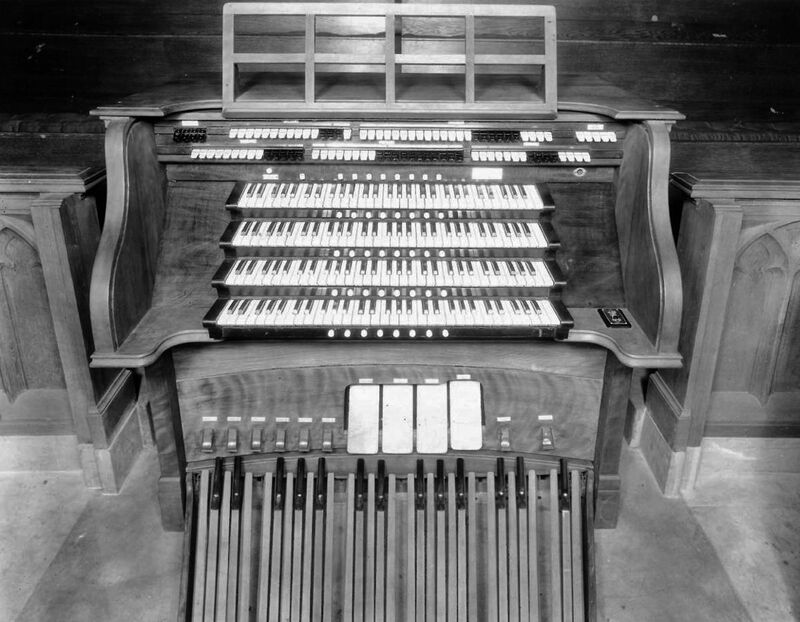 Greenwood, William P. Console of Wurlitzer Organ, Op. 839 (1924).